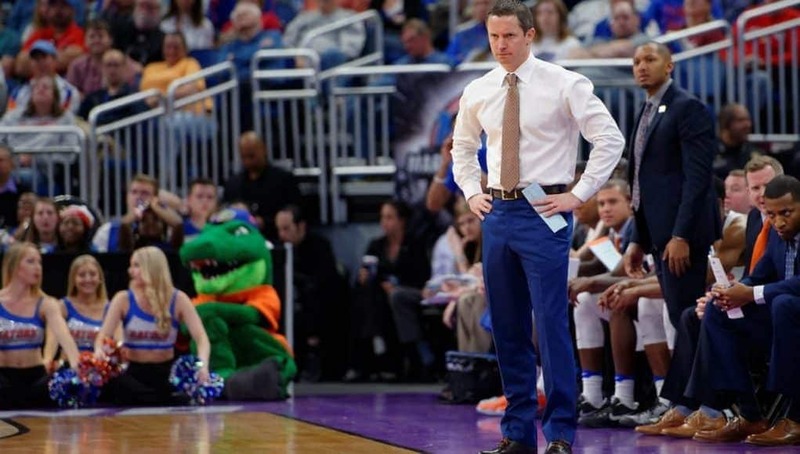 Florida’s NCAA Tournament standing took a huge swing in a positive direction after they took down Auburn on Saturday and they’ll look to better it even more when they head to Tuscaloosa on Tuesday, February 27 to take on the Alabama Crimson Tide. Game one of the season series saw coach Avery Johnson’s Crimson Tide blitz the Gators early in the second half quickly erasing Florida’s four point lead and outscoring them 41-17 for a 68-50 victory in Gainesville. The Gators will be looking to get some revenge for their lackluster performance and home and have their sights set on yet another “quadrant 1” victory. 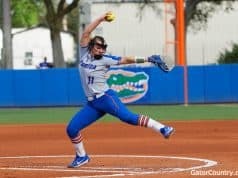 Let’s take a look at all the storylines leading into Tuesday’s contest and take a look at what the Gators can learn from their first meeting against the Tide to have a better outcome the second time around. Once looked at as a team deserving a very favorable NCAA Tournament seed the Crimson Tide are entering their game with the Gators on a 3-game slide losing to Kentucky (81-71), Auburn (90-71), and Arkansas (76-73). Florida has gone 3-0 against these teams that have handed Alabama their losing streak so they should have some confidence going in that they can stretch the Tide’s misfortunes to four games. Senior point guard Chris Chiozza enters this game needing 5 assists to pass Erving Walker and break the University of Florida’s all-time record. Averaging 6.2 per game he should be in a pretty good position to break it, although Collin Sexton gave Chiozza a boatload of problems in the first matchup and will make the record difficult. Chiozza has talked earlier in the season about embracing one-on-one matchups against elite point guards so I’m sure he won’t want to be embarrassed by the freshman again. Even if Chiozza doesn’t get the record tonight he is certain to break it at some point and that will be an incredible achievement for him. Particularly impressive is the fact that he has only been a starter for one season in his career, and you can also factor in that many of his career minutes have been when Kasey Hill was on the floor so it wasn’t like Chiozza was the only distributor. He has been an excellent Gator and this is a record he deserves to hold. Who are the Gators going to start? 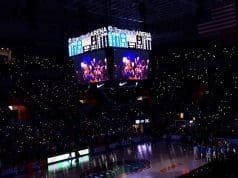 Though Saturday’s starting insertion of Jalen Hudson, Michael Okauru and Dontay Bassett to the starting lineup was a result of discipline to KeVaughn Allen, Keith Stone, and Kevarrius Hayes that first unit performed extremely well and it was actually the regular starters entering the game that blew a 9 point lead the first group accumulated. With the way KeVaughn Allen ended up playing I think he’ll be on the court for the opening tip but Keith Stone had a difficult game that could see the starting lineup stay fluid because of it. Alabama has some frontcourt pieces that really gave Florida issues so I’m expecting Dontay Bassett to play another big role in this one, but whether or not he gets rewarded for a great performance against Auburn with a start we’ll have to see. Nothing new regarding the Gator big men on the sidelines. Coach White has started to become visibly annoyed when asked about them, and I can see why. His concern is on games to be played with the roster he knows he has and he is going to trust his training staff to deal with his injured players. I’m in the same boat, and though I will always try to find updates on these guys I am going to stay more focused on upcoming games with the players we know we have other than dwelling on the mysteries that are injuries to the human body. Let’s take a look back at some of the storylines from the first Florida-Alabama game and see what the Gators can do to improve on a what was a disheartening game. One thing the Gators did really well was pressure Alabama’s young guards and come away with 12 steals while forcing 19 turnovers. Obviously it didn’t amount to a win or even a close game but most times you can generate that many turnovers you’re going to win and you’ve seen that multiple times from the Gators this season. Collin Sexton and Dazon Ingram were the sloppiest Crimson Tide players with the ball combining for 7 turnovers while Chris Chiozza and KeVaughn Allen combined for 7 steals. Florida’s veteran backcourt should keep the pressure dialed up on Alabama’s young ball handlers and hopefully it will result in similar turnover numbers. Alabama’s big men had a field day with Donta Hall and Braxton key going 11-11 in the paint and combining for 27 points. Allowing the opposing frontcourt to go 100% around the paint isn’t a recipe for success and the Gators will have to be better in there. Dontay Bassett should see a bigger roll than the 5 minutes he got in game one and hopefully he’ll bring the same tenacity he brought against Auburn. Though I pointed out the easy buckets Alabama’s frontcourt got it wouldn’t be fair to blame those all on Florida’s interior players. A lot of those layups came because a Crimson Tide guard beat his man off the dribble and a Gator big was forced to step up and help leaving his man open for a dump down pass. The perimeter defense needs to be better to keep Alabama’s guards going downhill as most of their offense comes from guards slicing to hoop and finishing or dropping it off to a big. If Florida’s perimeter guys can lock it down then Florida’s defense should look really tight. Shooting 64.1% from 2-point range and 30.8% from 3-point range I think it’s easy to see what Alabama is looking to do offensively and the Gators need to game plan accordingly. That poor 3-point shooting against the Gators wasn’t an anomaly as they are averaging 33.1% (265th in country) from deep and their 2-point efficiency has been solid all year averaging 54.5%, good for 41st in the nation. Against so many opponents the Gators have needed to run players off the 3-point line but against Alabama they need to flip that mindset and be focused on playing great help side defense and defending the rim first. Alabama’s 3-point percentage is probably going to be close to what it was in the first game but if the Gators can drop that 64% 2-point efficiency closer to 50% they could easily win this game. Alabama is a fantastic defensive team and their explosive athletes used their full focus to slow down Chris Chiozza (4 points on 2-9 shooting, 2 turnovers) and Jalen Hudson (6 points on 3-10 shooting, 5 turnovers) who we know are the main initiators for the Gators. Florida couldn’t shoot the ball from deep going 5-24 from three and scoring inside didn’t go much better as they were 14-33 from two. Avery Johnson and the Tide were fully aware of Florida’s struggles to score inside as when a player like Chris Chiozza or Jalen Hudson got dribble penetration the help side players went way out to plug up the drive, daring the Gators to try to dump it down to a player to score. Keith Stone, Kevarrius Hayes, And Egor Koulechov all lacked the confidence to get these passes and finish and that lead to a difficult offensive night for the Gators. Hopefully coming off a scorching hot shooting performance against Auburn they can make a bunch more threes but they’ll also have generate some layups at the hoop to have a balanced scoring output. The Gators had a 25-15 lead in the first half that made it look like it was going to be a good day but they couldn’t stay focused, particularly in the second half. 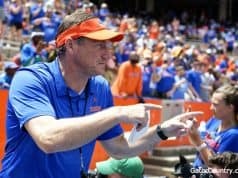 Whether that was all mental or some fatigue crept in (the Gators played 4 players more then 30 minutes) it was a big problem and they will need to put a full 40 minutes of effort into every game left this season if the team wants to meet their goals. Dealing with Alabama’s intense pressure on the perimeter. The dedication Alabama had to not allow ball movement made it incredibly difficult for the Gators to run offense and score. We saw the Gators run better offense against this style of defense when they took on South Carolina for a second time and had much better results so I expect them to play with a similar strategy against Alabama. They also need to find a way to protect the hoop better and eliminate the easy baskets the Crimson Tide were getting repeatedly. Florida can live with Alabama putting up catch and shoot threes but they can’t live with Alabama getting straight line drive layups at the tin. It’s another big game for the Gators. What are you expecting from them against Alabama? Leave a comment here or post on the Gator Country forums.